Speaking to the Guardian from their homes in Yobe state, the girls who had to leave their friend behind described how Leah and two others escaped together. After walking for three days, the three hungry and exhausted girls approached a family of the nomadic Fulani people, asking for their help getting home to Dapchi. But instead they were taken straight back to their kidnappers, according to Hajara Adamu, another of Leah’s friends. 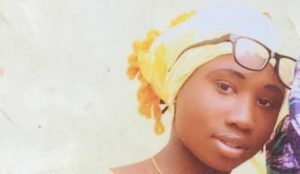 “The Fulani man said to them: ‘So you are the missing girls that we’ve heard about on the radio.’ He gave them a jerrycan filled with cow’s milk and brought them back,” Hajara said. Hajara had worse luck: when she tried to run away, she was whipped. She was frogmarched back to the camp with a gun at her back, after making the mistake of asking some local women for directions. “They started laughing at us and even insulting us, saying that we wanted to go back to the land of unbelievers,” Hajara said. They were given 10 strokes each. One girl was beaten with a branch from a thorn tree, before the kidnappers changed to a leather whip. But Hajara and some of her friends had hidden blankets under their hijabs to reduce the impact. “It wasn’t painful, but we had to pretend it was, but not cry, because they said whoever cried would get twice as many strokes,” she said. The girls described a terrible journey to get to the Lake Chad region in the days after they were originally abducted, during which they watched some of their friends die, trampled and suffocated to death in the packed truck. The girls shouted that some of them were dying, but by the time their kidnappers paid attention, five were dead. They kept driving through the night. “In the early morning, they dug a hole and put their bodies in it. They didn’t give them an Islamic burial, and they didn’t pray,” Hajara said. Hiding during the day and moving by night, they drove through scrub, walked up to their necks through water and hiked for hours through forest, before being rowed on wooden canoes to board the biggest boat the girls had ever seen. Arriving at an area shaded by trees, the girls were told they were in Tabdichadi, which means “water of Lake Chad”. They were in the Lake Chad region, near the border with Cameroon and Chad; herdsmen and travelling traders told local leaders that the girls were in a village called Tumbu Gini. For the next few weeks they stayed there, watching aircraft circle overhead. Seemingly back on their own turf, Boko Haram left only two guards to watch over their captives, but a tall, dark-skinned, youngish man with a long beard whom the girls only knew as “the Khalifa” came every week to see them. He would preach to them, the girls said, and reassure them that they would not stay in captivity for long. This man is thought to have been Abu Musab al-Barnawi, who in 2016 was announced as Boko Haram’s new leader by Islamic State, which had apparently had enough of the bloodthirsty tactics of his predecessor Abubakar Shekau against Muslims in the region. The fact that Leah walked for three days and was still sent back, along with the reference to a caliphate, suggests that Barnawi’s faction holds territory in the Lake Chad region. But the Nigerian government has repeatedly denied this. President Muhammadu Buhari himself remarked this month that Boko Haram “no longer have the capacity to hold a territory and challenge the sovereignty of the state”….